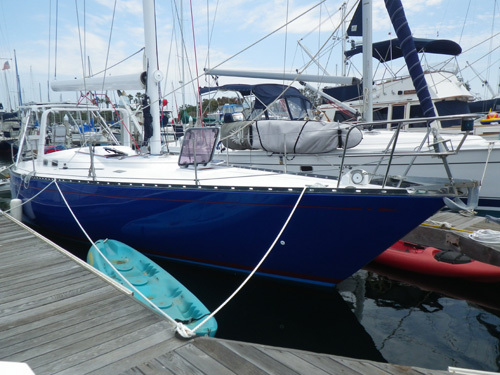 41' Tartan sailboat | Christian & Co. The vessel was inspected while hauled and afloat. Hull construction material is molded fiberglass. Deck is constructed of molded fiberglass and above deck structures are constructed of molded fiberglass. Deck coring is balsa (pre-existing) and marine plywood (new). Coring elsewhere is unknown. Bulkheads are constructed of plywood. Overall condition of the hull structure appears good. There is a soft area of deck, to starboard of the cockpit. The vessel’s weight is 19,000 lb. Exterior rails and hardware appear good – excellent. Mast, mast step, standing rigging and chain plates, where visible, appear good – excellent. Cosmetic condition of vessel appears good – excellent externally and good – excellent internally. Vessel’s external colors are blue with red stripes. Below waterline through hull fittings appear good. The vessel is equipped with one manual, one electric centrifugal and one electric/automatic submersible bilge pumps that appear good and the bilge is dry. The ventilation system consists of natural ventilation and appears satisfactory. General housekeeping appears good – excellent. The condition of the coring, in the stringers, deck, and elsewhere as applicable, is beyond the scope of this inspection. The vessel has had a major restoration. Engine’s external surfaces appear good and exhibit no rust, oil or coolant leaks. The engine was replaced with a new engine during the restoration. Engine hour meter exhibits one hour. Motor mounts appear good. Cooling system appears good. Fuel system and components appear good. Exhaust system and components appear good. Electrical system and components appear good. Engine control system appears good and shaft log appears good. Steering control system appears good and rudder port appears good. Propulsion components appear good. Waste system and components appear good. General service seawater systems appear good. There is 155 gallon fuel capacity in three stainless steel tanks, two (60 gallon) tanks are located aft and one (35 gallon) tank is located below settee (port saloon). Fuel tank surfaces, where visible, appear good and the securing mechanism appears good. The fuel fill, vent, feed and return lines and components appear good. Fuel shutoff valves are located at manifold aft of engine and appear good. The AC shore cord, inlet and connections appear good – excellent. The AC wiring and outlets appear good. The AC main feeds are protected with circuit breakers. Battery arrangement appears good. Batteries are equipped with a disconnect switch. DC wiring appears good. Circuit protection for the AC and DC branch system appears good. Wire terminations and connections appear good. Wire organization and arrangement appears satisfactory. Vessel has two portable fire extinguishers with expired certification. Vessel has no fixed fire suppression system. The safety components include: four adult type II PFDs and three inflatable type PFDs; distress flares with current certification – Nov. 2015; 20 KG SL claw anchor with chain and line rode and two additional anchors that appear good. Navigational and anchor lights appear good. Other safety equipment includes: 406 MHz EPIRB, throwable PFD, mouth operated horn, high water alarm and a canister air horn. Vessel is equipped with LP gas that fuels the galley range. Tanks’ external appearance is good and they are properly secured. Ventilation appears good. Tank valves were opened and an odor was not noticed. Feed line is equipped with a reducing regulator, a pressure gauge and an electric shutoff solenoid and feed lines appear good. The vessel was inspected at its normal slip location. Line condition and arrangement appears good. Boarding hazards appear insignificant. The vessel is a fiberglass performance sailing vessel designed by Sparkman & Stephens. The vessel was reportedly used as an IOR racing vessel. The client purchased the vessel in 1998 and performed miscellaneous upgrades while using the vessel until 2011. At that time a major restoration was begun at the client’s home in Fallbrook, California. The client stated “the boat was taken down to fiberglass” and restored. The restoration was extensive and included a new sub floor and sole in the interior, a redesigned and rebuilt V-berth, custom cabinetry forward and in the galley, a redesigned head, a new cabin top forward of the companionway (raised), much of the soft deck was taken down to the lower skin and rebuilt with marine plywood, replacing balsa. The mast was taken down and repainted, a new roller furling boom was installed (2001) and Pacific Offshore Rigging has replaced the standing rigging and running rigging recently. A new engine was installed by Bosun’s Locker in 2011. The fuel tanks were replaced with new stainless steel tanks, in 2005. The electrical system was completely replaced with wiring, distribution components and lights in 2012. Some of the electronics are new and some are not. The plumbing was all new in 2011 and 2012. The sails are from the 2000’s, they are reportedly in good condition. A new hard top was constructed by Pacific Yacht Towers in 2012. The vessel is in good structural condition. The engine was test operated briefly in the slip and it functioned normally. The vessel is significantly upgraded from a comparable vessel of its age, having just completed this extensive refit. 1. Provide new portable fire extinguishers and mount them conspicuously. 2. Replace the battery in the EPIRB. 3. Provide and install a neutral safety switch for the engine so that it cannot be started in gear. 4. Display the name and the hailing port on the transom, per federal regulations. 6. Provide and install safety retaining wires in the anchor shackles. 7. There is a soft area on the starboard side deck, just forward of the cockpit, address as necessary. 1. The HIN is partially obscured; display the HIN per federal regulations. 2. The propane tanks are not equipped with OPD valves, replace the tanks as necessary. 3. There are two through hulls aft, they are at or near the waterline and they are not equipped with valves. Provide and install the valves per A.B.Y.C. recommendations. An unused through hull in this area has a valve, but no plug or cap. Provide and install a suitable cap or plug. 4. The client stated that a cockpit enclosure has been ordered and is pending installation. 5. The client has not used the vessel since the restoration, exercise caution during the first few uses of the vessel. This survey sets forth the condition of the vessel and components, as specifically stated only, at the time of inspection and represents the surveyor’s honest and unbiased opinion. The submitting of this report should not be construed as a warranty or guaranty of the condition of the vessel, nor does it create any liability on the part of Christian & Company or the individual surveyor. No part of the vessel was disassembled or removed and no assumptions should be made as to the condition of concealed components. Specifics were obtained from sources available at the time of inspection and are believed correct, but are not guaranteed to be accurate. This inspection was performed for insurance and refinancing purposes and should provide the information necessary for underwriting. If any additional information is required, please contact the undersigned. This survey report is not intended for use as a “buyer’s survey”.